Should Kick Returners Always Take the Touchback? Starting in the 2011 season, the NFL returned the kickoff line to the 35. 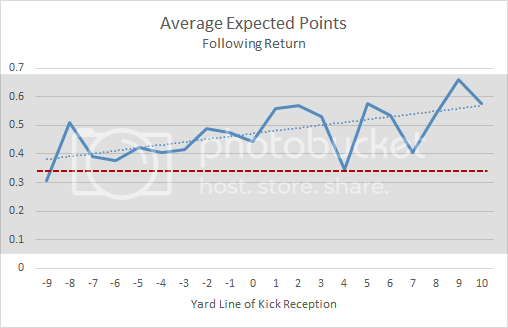 Due to ever increasing kick distances, the result was as predictable as it was intended--lots of touchbacks. Watching the Sunday night game this week, I was struck by how the Bears returner struggled to get past the 20. The Bears began their first four drives at their own 6, 15, 20, and 19. Their returner was bringing the ball out from deep in the end zone, and I wondered if it were simpler, safer, and better in the long run to just take the touchback. Does the risk of penalties, short returns, and turnovers outweigh the potential reward of a good return? Based on the Bears first four returns, no. But later in the game, their strategy paid off with a touchdown return. One lucky break does not make a strategy, however, so I looked at all the numbers, and I think I know the answer. The strange thing about this issue is that prior to 2011, returners would routinely accept touchbacks in situations they now regularly run out. And now, coverage personnel start out five yards closer. 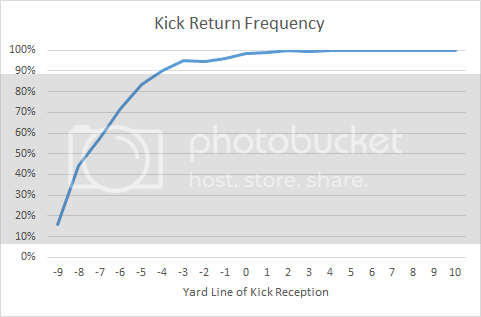 It doesn't make much sense that returners now run out deep kicks more often. If anything, they should now be more inclined to accept a touchback than they were prior to 2011 given the same kick depth. The first thing to note is that all the numbers presented here are subject to selection bias. In other words, returners don't run deep kickoffs out of the end zone willy nilly. They make a decision based on whether they believe it's favorable to run it out based on the hang time of the kick, the situation in the game, and their coaches' guidance. But that's ok, because we can still evaluate whether the current typical return policy is sound, or whether return squads would be better off taking touchbacks more often, up to and including always. Here is how often returners currently bring out kick offs based on kick depth. All data is from 2011 through week 10 of the 2014 season and is restricted to non-onside kicks from the 35. 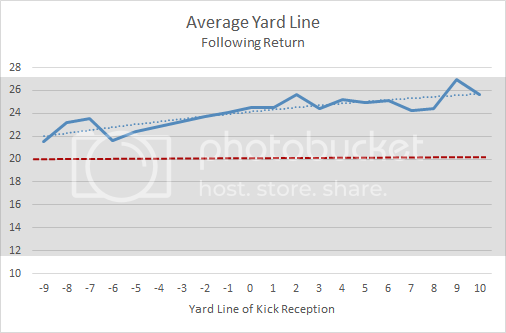 The chart below plots the average return yard line based on the depth of the kick. Negative numbers indicate the kickoff's depth into the endzone. Predictably, the deeper the kick, the shorter the result of the play. At first glance you might think it's always a good idea to bring out the kick. The average yard line of the return is always beyond the 20. But that's a plot of the average return, given that the returner chose to run it out. This result suggests returners are generally making the right decision. Unfortunately, things are more complicated. What about the risk of a turnover? A turnover returned for a touchdown? A penalty? Just a few years ago, we would have produced the chart above, done some handwaving to dismiss the consideration of penalties, scores, and turnovers, and called it a day. But now we've got models like Expected Points (EP) which can factor virtually every consideration into the analysis. Here's the average EP as a result of all kick returns. In the version of EP I used for this analysis, a 1st and 10 at the 20 is 0.34 EP for the offense. But touchbacks can have penalties, so the average net EP for a touchback is 0.33. Anything above that means that bringing out the kick was probably a good idea. If returns from, say, 6 yards deep in the endzone result in an EP value below that, it means returners should generally be more inclined to accept the touchback. Where EP values are above 0.33, returners should be generally more inclined to run kicks out of the end zone. As we might expect, resulting EP values increase steadily as the depth of the kick decreases. What surprised me is that EP values for returns are greater than for touchbacks for every possible kick depth. Only at 9 yards deep into the end zone does it appear a touchback has greater average value, and there are only 86 such returns since 2011 so that is very possibly due to statistical noise. This does not mean returners should be running out every kick that goes 8 yards deep into the end zone. It means that given the current typical return tactics, returners could probably be a little more aggressive than they are now and still break even. It also means that returners (and their special teams coaches) were probably far too conservative prior to 2011. The bottom line is no, returners should not always accept the touchback. The current balance is very close to the break-even point, and returners could stand to be slightly more aggressive. My recommendation is that teams seeking high variance (losing or underdog teams) should lean toward bringing out more kicks. Teams that seek low variance (winning or heavily favored teams) should lean toward accepting the touchback.